A detector on NASA's Curiosity rover has confirmed previous research findings on the hazards of space radiation on the way to Mars, scientists announced Thursday, and future astronauts making the trip will need protection from the danger. The Mars rover's radiation-detecting instrument, called RAD, collected data on the mission's eight-month cruise to the red planet in 2011 and 2012, verifying computer models predicting radiation levels on the way to Mars are several hundred times higher than the dose humans receive on Earth. Nestled deep inside a heat shield and aerodynamic shell - not too different than astronauts inside a space capsule - the rover's detector still picked up particles from a harmful flow of radiation from the sun and galactic sources. "This cruise data is critical to the understanding of the impacts of galactic cosmic rays and solar particle events inside a platform similar to the vehicle we're developing for human exploration missions," said Eddie Semones, a spaceflight radiation health officer at NASA's Johnson Space Center in Houston. Against a near-steady stream of galactic cosmic rays streaming into the solar system from supernova explosions and other sources across the galaxy, Curiosity encountered five spikes in another type of radiation called solar energetic particles, which blow outward from the sun during solar flares and coronal mass ejections. Semones said the radiation data from the Mars rover confirmed estimates based on models and information from other missions. "We found during the cruise that galactic cosmic rays were averaging 1.8 milliSieverts per day throughout," said Cary Zeitlin, principal scientist from the Southwest Research Institute. "That's actually a value that's very much in line with earlier data from Apollo and Skylab." Scientists measure radiation in units called Sieverts. According to Semones, exposure to 1 Sievert of radiation raises a person's risk of developing fatal cancer in their lifetime by 5 percent. In six months, Curiosity's RAD instrument detected 330 milliSieverts of cosmic radiation. On the International Space Station, which is clad in polyethylene shielding and flies below Earth's radiation belts, astronauts typically see about 100 milliSieverts in a six-month rotation. The figures don't include solar energetic particles, which accounted for about 5 percent of the radiation detected by the rover on the cruise to Mars. During periods of elevated solar activity, astronauts could be exposed to more solar radiation, Zeitlin said. 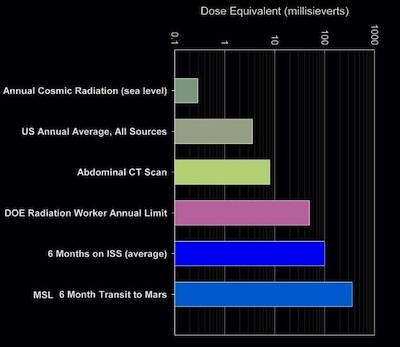 According to Zeitlin, radiation levels detected by Curiosity - adjusted to gauge their impact on human issues - are equivalent to the dosage received in abdominal CT scans every five or six days. Over the course of a 500-day Mars mission, Semones said most astronauts would exceed NASA's health standard, which limits an individual's radiation exposure to levels that would cause no more than a 3 percent increase in the risk of fatal cancer. 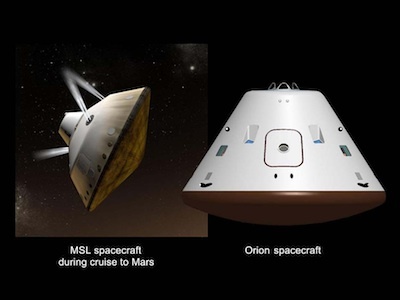 "We're looking at that 3 percent standard and its applicability on exploration-type missions," Semones said. The radiation results from the rover's cruise to Mars are published in Friday's issue of Science. Curiosity's RAD instrument continues collecting daily measurements since its landing on Mars in August 2012. Scientists are using the data to see what radiation levels astronauts would encounter on the planet's surface on landing missions. Engineers and scientists will use the rover's radiation measurements in development of spacecraft to carry astronauts beyond low Earth orbit. Semones said the data are applicable to NASA's asteroid capture mission and manned trips to the vicinity of the moon, which are planned to begin in 2021. 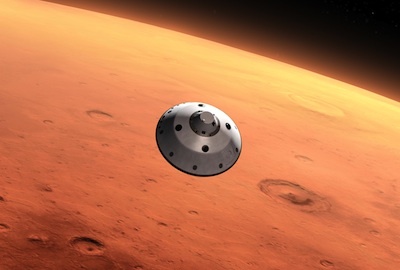 "The RAD data will help us to design deep space habitats in which astronauts would live on the way to Mars, and it will help us to improve radiation shielding to protect them from the harmful effects of space radiation," said Chris Moore, deputy director of advanced exploration systems at NASA. For transient events such as solar storms, which temporarily raise radiation levels, NASA could provide 'storm shelters' to house astronauts and protect against radiation until the threat passes, Moore said. Astronaut habitats will need more permanent shielding against galactic cosmic rays. Moore said water in the walls of space modules would help blunt radiation, or astronauts could store hydrogen-rich food and supplies around their living quarters as a shield. But efforts to protect astronauts on trips to Mars will not stop there. According to NASA, advanced propulsion systems must be developed to make more speedy journeys possible because the type of shielding necessary to protect against cosmic radiation - several meters thick, Semones said - is impractical due to the size and mass limitations of spacecraft and launch vehicles. "You need both," Semones said, referring to shielding and advanced propulsion. "You need to get there faster to reduce the impact of galactic cosmic rays, but you also need to have local shielding on-board to eliminate the effects of solar particles." Moore said NASA is working on solar-electric propulsion, which uses electricity to accelerate ions and generate low, but sustained, thrust, as part of the agency's technology development for deep space exploration, including NASA's proposed initiative to capture and study an asteroid. "But to get really fast trip times and cut down on the radiation exposure, we would probably need nuclear thermal propulsion," Moore said. "We're working with U.S. Department of Energy to look at various types of fuel elements for these rockets. But it's a long-range technology development activity, and it will probably be many years before that is ready." According to Moore, nuclear propulsion could cut the one-way transit time from Earth to Mars to about 180 days.